Do children and adults with Down syndrome have a specific developmental profile of strengths, weaknesses and needs on which early intervention, education and healthcare should be based if they are to be effective? Do children and adults with Down syndrome have a specific developmental profile of strengths, weaknesses and needs on which early intervention, education and healthcare should be based if they are to be effective? This was the question addressed at a conference at the end of February, 2005 in Mallorca, Spain. Two hundred and sixty delegates and speakers from 17 countries attended a very worthwhile meeting to address the question of specificity in Down syndrome. The conference was organized by Asnimo (the pioneering organisation for the support of children and adults with Down syndrome established on Mallorca 28 years ago), the University of the Balearic Islands and EDSA (European Down Syndrome Association) with the support of DSI (Down Syndrome International). 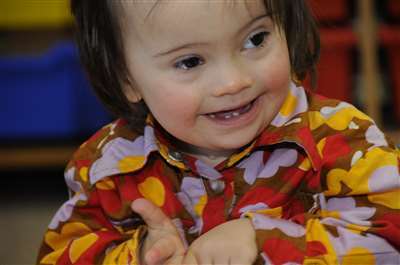 In what precise ways does Down syndrome influence the development of children and adults with Down syndrome? Is their profile of development different in some ways from that of typically developing children? Is their profile of development different from that of children with developmental delays that have other causes (not Down syndrome)? Should education and interventions be adapted to take account of this profile (rather than being the same as those offered to other children with learning difficulties)? In his presentation, Juan stressed the importance of knowing the answers to these questions in order to effectively address the healthcare, early intervention, educational and social needs of individuals with Down syndrome. The keynote speakers all addressed the issue of specificity in their presentations. In this report of the conference, I will summarise the main points from the presentations and their conclusions with regard to specificity and then add some conclusions from our own work - as this is a very important issue. It gets to the heart of understanding exactly how the extra chromosome does effect all aspects of development and this has to be the starting point for developing the most effective ways to support individuals with Down syndrome and their families. the social or interpersonal issues - specifically the needs of families. Several speakers addressed research into the physical development of individuals with Down syndrome, at the genetic, pathological, neuropsychological and healthcare levels. Krystyna Wisniewski, of the Institute for Basic Research in Developmental Disabilities, New York, USA, described what is known about brain structures at the cellular and structural level, and the new approaches available to laboratories that may give more information about the biochemistry and function of the brain. David Patterson, of the University of Denver, USA, looked at the information on ageing, linking clinical findings on the higher incidence of ageing conditions for individuals with Down syndrome with the research into the genetic influences on this. David explained the value and potential of the use of mouse models for trisomy 21 (mice bred to be trisomic) for researching what may be causing earlier ageing and also for evaluating possible treatments. Another paper, from Lynn Nadel of the University of Arizona, USA, addressed these issues from the neuropsychological level. Lynn was unable to attend and his paper was presented by David Patterson. This paper described studies of learning, memory and spatial abilities in both children and adults with Down syndrome and in trisomic mice - and the possible links between the pattern of these abilities and areas of the brain such as the hippocampus, cerebellum and prefrontal-cortex, known to be structurally affected by the extra chromosome 21 in humans. Research into genetics and into brain function at every level in typically developing individuals is progressing very rapidly, as we have more new methods to study typical brain function which are leading to greater understanding of how the brain works. This means that, as we know more about normal function, by comparison, we are able to discover more and more about the subtle effects of the extra chromosome 21 on brain function. The research into the effects of Down syndrome on the way the brain and body functions being conducted by geneticists, biochemists, pathologists and their many colleagues in associated professions is rapidly adding to our understanding and may eventually lead to some therapeutic approaches. However, while there are many differences observed and documented in brain structure and cellular function when the extra chromosome is present, it is not possible at present to draw precise conclusions about the links between these differences and development. Interpretation of the differences reported is difficult as the structure and functions of the brain develop rapidly from birth to adult life - they are not fixed by genes at birth in any simple way. For example, as any child learns to walk and talk the areas of the brain associated with these activities show very rapid change and development. Input, activity and learning influence brain development, therefore differences in the structure and function of the brain in a child or an adult with Down syndrome may reflect the lack of development of particular skills as well as reflecting the effect of the extra chromosome. New non-invasive brain imaging methods such as functional MRI (magnetic resonance imaging) and MEG (Magnetoencephalography) which allow scientists to study the brain in action may allow these issues to be explored more effectively as changes in brain function may be able to be studied over time in the same individuals. Some MEG studies of brain function in individuals with Down syndrome are, in fact starting at the Down Syndrome Research Foundation in Vancouver, Canada, and one of their research collaborators, Daniel Weeks of Simon Fraser University, described some preliminary results in an afternoon session at the conference. The final presentation on the physical effects of Down syndrome was presented by Alberto Rasore-Quartino, from Genoa, Italy. He described the health and medical issues associated with Down syndrome - highlighting those that occur with a greater incidence in children and adults with Down syndrome, and some that occur less often. Almost all medical and health conditions are treated in the same way for a person with Down syndrome but knowing about the greater risks of some illnesses helps parents and physicians to be spot them quickly or to screen for them. Many countries now have this information available as published guidelines, which are regularly updated - see resources at the end of the article. The majority of the other keynote presenters discussed studies of psychological or behavioral development including memory, speech and language, cognitive and social development. The first of these was a paper on memory research presented by Darlynne Devenny, of the Institute for Basic Research in Developmental Disabilities, New York, USA. Darlynne highlighted the central importance of memory for all aspects of what we learn and what we do each day. She explained that research has identified different types of human memory and the first division is between implicit and explicit memory systems. Implicit memory is relatively unintentional and automatic - implicit memories are acquired without conscious effort - such as an infant learning grammar in a first language. Explicit memory is intentional and effortful - such as learning history facts in school or the rules of the Highway code to pass a driving test. Explicit memory can be further subdivided into Working Memory - the short term memory system used to hold information coming into the brain while processing and understanding it, and used for mental reasoning tasks, and Episodic memory - the system which stores memories of life events. Darlynne went on to summarise what is known about the memory strengths and weaknesses usually experienced by individuals with Down syndrome. More is known about the Working Memory system in individuals with Down syndrome than the other types of memory and we know that within this system, visual short-term memory is a strength and verbal short-term memory is a weakness. This will mean that learning to talk and processing spoken information is more difficult for children with Down syndrome. Longer term, Implicit memory seems to be a relative strength, though initial learning and consolidation of skills may take longer. In Episodic memory, individuals with Down syndrome seem to have some weaknesses in spatial memory, though the ability of many to find their way around their schools and neighborhoods suggest that not all aspects of spatial memory are equally affected. Memory for autobiographical events may be a weakness as Darlynne demonstrated that individuals with Down syndrome may recall less detail and have more difficulty retelling the details when remembering an event such as a visit. She ended her presentation with some pointers for interventions to improve memory skills such as emphasizing phonological (speech sound) awareness from infancy, using multi-sensory input for teaching to use visual memory strengths to support verbal memory weakness and building in much practice and repetition. The specific difficulties in working memory have been researched in some detail and readers can find many papers and practical intervention advice such as Darlynne recommended on the charity's information website and in publications - see resource list at the end of the article. Jean Rondal, of the University of Liège in Belgium, presented a detailed description of the speech and language development of children and adults with Down syndrome. He pointed out that most have strengths in developing vocabulary and in being able to communicate their meaning as they get older, but weaknesses in developing grammar and intelligible speech. He explained the way in which this pattern was different from that seen in individuals with learning disabilities from other genetic causes. He also identified the implications of this profile for interventions - which should focus in particular on the need to develop articulation and phonology for clear speech and on developing the use of grammar. However, it is also important to remember when we discuss relative strengths and weaknesses that early vocabulary is learned more slowly than it should be and that all aspects of learning to talk will benefit from targeted games and activities. Jean recently edited a book on speech and language intervention for individuals with Down syndrome which contains research reviews, information and advice on intervention for all aspects, though aimed at professionals rather than parents. Robert Hodapp, of Vanderbilt University, Tennessee, explored the findings more broadly on intellectual functioning, language and social development. He drew attention to a specific profile of strengths and weaknesses at this level. He highlighted the frequently reported fact that expressive language usually lags behind non-verbal mental abilities in children and teenagers with Down syndrome, that visual memory is a strength relative to verbal memory and that sociability is usually a strength. This general profile was returned to by two later keynote presenters (Donna Spiker and Deborah Fidler). Robert and some other presenters considered the ways in which the profiles of children with other genetic conditions such as Williams, Prader Willi and Fragile-X syndromes are similar to the profile associated with Down syndrome. This is of research interest but is not discussed in detail here as it is not directly relevant to understanding how to educate and support children with Down syndrome. Robert drew attention to the fact that the developmental progress of children with Down syndrome might be thought of as 'fragile' as they seem to need more practice to consolidate their learning and sometimes seem to 'lose' skills that they seemed to have learned. While the majority of children with Down syndrome make steady, if slow progress, the rate at which they are learning slows over time and falls behind that of other typically developing children. This is why studies show IQ scores often drop over time as they are based on comparisons with the rate of learning of other children. Children with Down syndrome learn and progress but not fast enough to maintain the same IQ scores from infancy onwards. Some clues to why this happens may emerge from research identifying learning styles, which could slow cognitive development. For example, studies by Jennifer Wishart at Edinburgh University suggest that toddlers with Down syndrome may 'misuse' their social skills to distract parents and teachers when they are faced with learning tasks that they find difficult. They do not then complete the tasks and learn how to solve them, they play social games instead. This important theme was taken up and explored further by Deborah Fidler of Colorado State University. She reported that her own research shows that this characteristic profile, with social development going ahead of language and cognitive development, can be seen in toddlers as well as older children and she argued that it might be possible to develop intervention strategies to stop this pattern and to prevent cognitive development falling behind. Deborah showed clips of videotape which clearly illustrated toddlers with Down syndrome avoiding tasks such as finding shapes in a puzzle box by playing social games in a way that other mental-age matched toddlers just did not do. Deborah suggested that research indicates that early problem solving or 'strategic thinking' seen when infants look for a hidden toy or pull a string to reach a toy is delayed for infants with Down syndrome - leading to the task avoidance social games that they often develop. She has just begun to see if training studies which focus on teaching the toddlers (at 25 to 35 months) to solve the cognitive tasks will accelerate their progress and prevent the counterproductive social games from developing. This is exciting work, and references to Deborah's studies are at the end of this article. Deborah began her research career with Robert Hodapp and they are both coming to the UK to take part in the conference on Early Education and School Education which is being held in Portsmouth in September this year - see details on page 101. Donna Spiker, from the Early Childhood Programs Center for Education in California, continued to draw on the research into specific developmental strengths and weaknesses to outline an evidence-based approach to early intervention for infants and preschoolers with Down syndrome. Donna is well known for her work in early intervention beginning with work with children with Down syndrome more than 30 years ago in Minnesota, USA with another pioneer who did much to raise expectations and improve education, John Rynders. She stressed the need to base actual early intervention activities and programs on the research into the profile of strengths and needs of children with Down syndrome but equally to remember the variability of the children. While most children with Down syndrome show the typical patterns, the degree to which they show them and the rate at which individual children progress varies widely. and that families are also all different. The message is - start with a knowledge of the research and the expected profile and then adapt the recommended approaches to the needs of the particular individual and the expectations and preferences of his or her family. Under each of these headings, she highlighted particular issues that may need to be considered for children with Down syndrome. For example, under health, she stressed the importance of recognising that serious heart conditions or early significant health problems may affect the babies' energy to explore and slow their developmental progress (though they may well catch up later) and may increase parental anxiety. She also reminded the audience of the need to address the effects of 'glue ear' on learning language and stressed the need for more research into the effects of sleep disturbance on development. When considering strategies to promote cognitive development, Donna reminded delegates of the profile of strengths in visual memory and weaknesses in verbal memory, therefore the need to use visual cues for teaching whenever possible including signing and gestures, picture, photos, print and the computer. She also mentioned the research already described which shows that children with Down syndrome may be less persistent in mastering new tasks and exploring their toys - and the need to build in practice to consolidate learning. Parents and carers need to think of imaginative and fun ways to show children how to solve tasks and develop games to encourage practice. Donna drew attention to the way in which all interactions between parents and infants are influenced by how the infant behaves - and a number of studies indicate that parents of babies with Down syndrome do adapt to their children - often discovering that they have to be a little more active in stimulating responses and directing their attention and learning. We do not know enough about the way some of these patterns develop and whether they all help or hinder children's progress over time but we do need to think about this and to do further research. When considering strategies to develop communication and spoken language, Donna identified some recent studies which indicate the need to enable parents to develop sensitive and effective communication strategies throughout their daily communication with their children and to build speech and language activities into child-centerd toy play and motor games. She also emphasized the benefits of using signs and gestures, and the importance of following the child's lead whenever possible. Under her final heading, she reminded delegates of the importance of adapting to children's individual temperaments but also the need to encourage behavior control and socially acceptable behavior, pointing out that difficult behavior will interfere with learning and progress and increase parental stress. She then went on to explore briefly the role of early intervention programs in providing support for parents and families, not just focusing on the child's progress. The needs of families was the topic for another keynote presented by Laura Nota and Salvatore Soresi of the University of Padua in Italy. They reviewed the research into the effects of raising a child with Down syndrome on the family, highlighting findings that indicate that these families experience less stress than those raising children with autism or with other types of learning disabilities and that most cope well. There may be a number of reasons for this, including early diagnosis, the availability of early support from services and from parent groups, the sociable nature of children with Down syndrome and fewer behavior problems. These findings do not suggest that parenting a child with Down syndrome is not demanding and, at times, stressful but that the needs of families may vary depending on the diagnoses of their children's disabilities - another indication of specificity. The presenters identified that the needs of families are different at different stages of children's lives and that services should recognise this. They identified that breaking the news at the time of diagnosis is still often not done well - either insensitively or in an ill-informed manner. Too many physicians still have outdated knowledge and negative attitudes. They also stressed that each stage brings its own challenges, starting school, reaching adolescence, leaving school and in too may countries real social inclusion and friendships, opportunities for employment, meaningful day-time activity and the chance to live independently of the family are still not available for most adults with Down syndrome. Parent support needs at each stage were identified. It was also suggested that a parent training program could be helpful in the early years to give parents the knowledge, skills and strategies to face the challenges of raising a child with Down syndrome and promoting their development, the need to negotiate with professionals for services and the need to take care of themselves and their family relationships. The presenters have developed such a program for parents in Italy. This summary does not do justice to the quality and detail of the presentations, but hopefully it does give the reader and idea of the key points. There was general agreement that children with Down syndrome do show a specific developmental profile - strengths in social understanding and as visual learners and more difficulties with motor progress, speech and language, and verbal short-term memory. This can be summed having strengths as visual learners and more difficulty in learning from listening. A number of other messages - learning styles, using social strengths to avoid learning, needing more practice to really consolidate learning - also came through. Is it important that we know this and adapt our early interventions and educational approaches to take account of this profile? Some observers of early intervention programs were putting this view forward many years ago - suggesting that we would not see benefits for our children if we did not adapt teaching approaches. Each year we learn more in detail about these issues but I would argue that we do have evidence of the benefits of education which takes account of this profile. One example would be the data that we have collected at Down Syndrome Education International on the outcomes for teenagers in schools in 1999/2000. The teenagers who show significant gains were educated in mainstream classrooms - their education was informed by our knowledge of verbal memory difficulties and being visual learners. Reading played a big part in their teaching programs - adapted to support their speech and language learning. This study can be found in full at http://www.down-syndrome.info/library/periodicals/dsnu/02/2. However, I still think that we have a long way to go in ensuring that all those working in healthcare, in early intervention and in our schools are aware of how much we know about the specific needs of children and adults with Down syndrome. Early intervention programs and nursery staff still need access to good materials and training to ensure they do understand the needs of our children. Mainstream and special education teachers also need access to training and information - in our experience in the UK, mainstream teachers are often better informed than special school teachers. Special school teachers often see children with Down syndrome as like the other slower learners that they work with and this is often not the case. The exciting messages from the conference for me were that we are becoming better informed in more detail about the early effects of this profile. The work that Deborah Fidler is doing with toddlers is potentially very important. She is looking at the stage at which we begin to see cognitive skills dropping behind social skills by the second year of life and evaluating practical ways of working with toddlers to compensate by teaching them to learn to solve cognitive tasks - and teaching those around them to not be drawn into social games during these sessions. We will watch this work closely. Marder, E. and Dennis, J. (1997). Medical management of children with Down's syndrome. Current Paediatrics, 7, 1-7. Cohen, W.I. (1998). In Hassold, T.J. and Patterson, D. Down Syndrome: A Promising Future Together. Wiley-Liss. 3. Buckley, S. and Bird, G. (2001). Memory Development for Individuals with Down Syndrome. Down Syndrome Education International, Portsmouth, UK. 4. Rondal, J. and Buckley, S. (Eds.). (2004). Speech and Language Intervention in Down Syndrome. Whurr Publishers Ltd.
6. Fidler, D.J. (2005). The Emerging Down Syndrome Behavioral Phenotype in Early Childhood: Implications for Practice. Infants and Young Children, 18, (2), 86-103. Fidler, D.J., Philofsky. A., Hepburn, S.L. and Rogers, S.J. (in press). Nonverbal Requesting and Problem Solving in Young Children with Down Syndrome. American Journal on Mental Retardation. Yoder, P.J. and Warren, S.F. (2004). Early Predictors of Language in Children with and without Down Syndrome. American Journal on Mental Retardation, 109(4), 285-300.